At the end of the day, you can get a level higher in the performance category with a more polished fit and finish by going with something like an Ego mower, but you'll pay a couple hundred dollars more to get there. It seems strange to say that there are a plethora of lithium-ion lawn mower options on the market. They’re not exactly flying cars, but we’re mowing our lawns – mowing – with a battery. We introduced most of the major players a couple years ago in our battery powered mower roundup. Ryobi has given their model an upgrade with the Ryobi 40V Brushless Mower keeping some of the best features and improving others. On paper, there are only a couple of key differences aside from the model number (that’s Ryobi RY40180 if you’re keeping score). For starters, you now get a 5.0 amp hour battery instead of two 2.4’s. The price has also dropped by $100 from our testing a couple years ago. Some things are better left alone, and this version of Ryobi’s mower still sports a brushless motor and 20-inch deck. Assembly doesn’t usually make my top 5 features list, but the assembly instructions consist solely of opening the box and taking it out – that’s a big win. All you need to do is have a few hours to let the battery charge, set your deck height and decide if you want to put the mulch plug in or stick the bag on. The bag is incredibly simple to install. You’re basically setting it in place on the back which takes all of about 15 seconds to get right the first time. The mulching plug is a little less intuitive, but once you see how it fits, it makes sense. If you’re going to have a successful battery-powered lawn mower, it starts with the motor and you’ve got to go brushless. It’s the only way to ensure you get enough power while maximizing the runtime. As an added bonus, the electronic controls required for a brushless motor also gives the mower the ability to run harder in thick grass and back off where it’s thinner. There’s a nice range of heights to choose from starting as low as 1-1/2 inches and going up to 3-3/4 inches. I prefer to mow at 3 inches to give the grass the chance to get thick enough to choke out weeds. 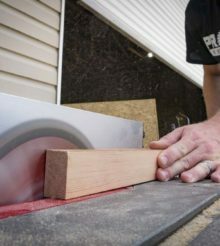 Adjusting the cutting height is easy. One lever moves all four wheels up or down with less effort than I expected. It also locks into place solidly – something you should expect but still check before buying. When we first reviewed the Ego 56V mower, one of its standout features was the ability to fold up to a space-saving size. Ryobi is on board with a similar design. The handle telescopes down and folds over the top of the mower. From there, simply stand it up on its rear and set it in the corner or wall of your shed. It takes up much less room than a gas mower that can’t be set on end. The telescoping handle also gives you the ability to lock in a height for nearly every user instead of just a few preset detents. One thing to note is that you’ll need to move the height adjustment all the way down to get the handles to lock in tight. Higher positions get in the way. Fortunately, the height adjustment is as easy as it is, so it’s only a minor irritant. The big draw with lithium-ion mowers and other OPE is that there aren’t any of the issues of gas engines. No carburetors to gum up, no fuel and oil to mix, no emissions, and quieter operation. The Ryobi 40V Brushless Mower has all of the benefits, but what is probably the most pleasant surprise for new users is how quiet it really is. I was able to have a phone conversation with my wife while mowing the lawn. Not through a headset or earphones, but just a phone-to-ear conversation with no ill effects. It’s even quieter than vacuuming your house. Unless of course, you have a Hoover cordless vacuum. All those features are great. but don’t mean squat if it can’t actually cut the grass. Unfortunately, Central Florida is in a drought, so the lush green lawn is more a garden of weeds with dormant grass. Still, we skipped winter altogether, spent roughly 4 days in spring, and jumped right into the summer mowing season – and that was back in March. Aside from the weeds, there’s a combination of Bahiagrass and Bermuda grass in my lawn. The nice thing is that both return fairly quickly when the rain starts and the Bahiagrass is particularly hearty. Most of the lawn didn’t require a lot of effort from the brushless mower. It just plowed along and left a fairly even cut. Around the front where the grass is doing better thanks to shade from the trees, things were a little thicker. The motor controls audibly picked up the power as it cut through the more dense grass. One thing to look out for on any mower is the blade speed. The slower the blade, the more often you need to sharpen it to effectively cut and gas mowers are usually able to keep the speed up better. It definitely feels like the Ryobi 40V Brushless Mower is a little slower in the blade speed area and I had to go over a couple areas twice where the grass/weeds were tall and limp. However, it did much better in the dense areas. Ryobi claims you can get up to 45 minutes of cutting on 1 charge with their 5.0 amp hour battery and I was awfully close at 44:30. As the battery got down to one bar, the mower started cutting off. It would immediately restart after letting go of the bar and hitting start again and it didn’t seem to be a thermal issue (though I wouldn’t blame it with 95 -degree days here already!). It started about 38 minutes in and became pretty frequent after 42 minutes. Realistically, you’re looking at somewhere around 40 minutes of runtime before the interruptions really begin to get in the way of your productivity. UPDATE: Having spent more time using the mower, the intermittent shutdown is definitely not thermal and it’s fairly random. Sometimes it’s frequent, other times, not as much. But it does happen every time I mow. Simply restart the mower and you’re back on track. At this stage, it’s only an irritation, but it is irritating. The issue seems to be with the microswitch on the right. I’ll work on it and come back around for another update. $299 is a compelling price for a 20-inch brushless mower that comes with a battery and charger. The performance is good enough for most lawns and does better when the grass is dense enough to provide some good resistance for the blade to work against. There are plenty of pros to offset the cons on this model. The folding design and price are definitely standouts along with the easy height adjustment. I like the fact that you have a mulching option – which I primarily use – and bagging, but I’d like to see a side discharge as well. The only major complaint I have is the stuttering performance as the battery gets near depleted. However, you’ll get around 40 minutes of uninterrupted runtime. The Ryobi 40V Brushless Mower is a good pick for lawns up to 1/4 acre unless you plan on picking up a second battery. At the end of the day, you can get a level higher in the performance category with a more polished fit and finish by going with something like an Ego or more durable build with an Echo, but you’ll pay an extra hundred dollars or more to get there. The mower keeps shutting down intermittently. Have you found the reason for this. Seems to happen a lot when the rear wheels are raised to re-position the mower. Raising the front wheels doesn’t seem to cause it. This is a self propelled model operating in non propelled mode. How long does it take to fully recharge the battery after it is down?